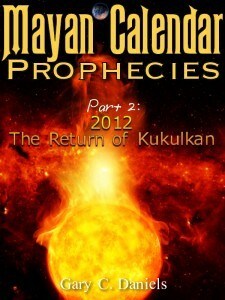 The new e-book, Mayan Calendar Prophecies | Part 2: 2012 The Return of Kukulkan, takes a fresh new look at the legends surrounding the mythological figure of Kukulkan, a green “sky serpent” associated with death and destruction especially floods and severe storms. 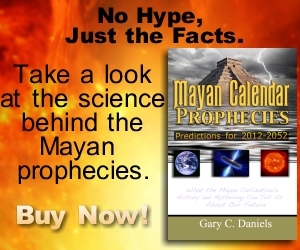 Mayan prophecies predicted the return of this mythological figure sometime between 1993-2012. Interestingly, in August 2004 a new green comet was discovered and named Comet Machholz. Since the return and discovery of Comet Machholz in August 2004 Earth has experienced some of the most severe storms and earthquakes in recorded history. Some of the most severe space weather including the most powerful solar flares and gamma ray bursts in recorded history also occurred since 2004. That year also had the most naked-eye visible comets ever recorded which suggests an increase in the amount of space debris entering the solar system thereby increasing the odds of an impact with Earth. It was also in 2004 that NASA scientists discovered the asteroid Apophis was on a collision course with Earth. Climate scientists have predicted that due to global warming these severe weather events will only get worse in the future. Space weather scientists say the sun appears to have entered a new period of increased activity. Geologists have noted there has been an increase in major earthquakes along the Pacific Plate since 2004 and they also expect more of the same in the future. Is this all a coincidence or are these events part of a natural, predictable cycle that happens every 12,500 years and just so happens to correspond with the orbit of Comet Machholz? Were the ancient Maya aware of this cycle and did they encode it in their myths about the return of Kukulkan, a green sky serpent that devours humans, as a warning and a visible sign post in the heavens to alert when the next age of catastrophes would begin? Does the calendar date of December 21, 2012, mark the end of our rather quiet and peaceful epoch and the beginning of a new age of catastrophes similar to those that befell Earth in 10,500 BC? This book explores the myths and legends of not only the ancient Maya but also the Greeks and Egyptians to see what these ancient civilizations were trying to tell us. The book also explores the latest scientific discoveries about the dangers that lurk in our Universe from gamma ray bursts to earth-crossing asteroids and the likelihood that Earth could be impacted by them in the near future.